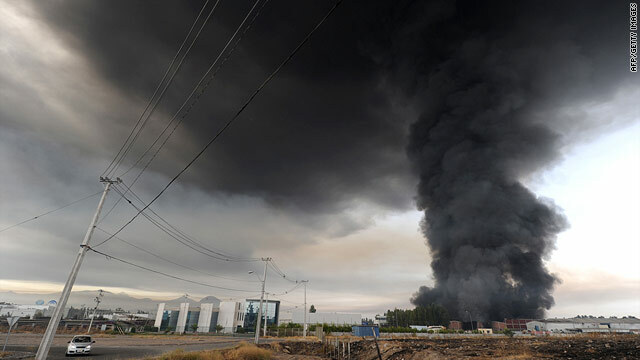 Smoke from a large fire towers into the sky outside Santiago, Chile, after Saturday morning's earthquake. Ongoing developments in the Chilean earthquake and the tsunami warnings that followed. All times are local in Chile, which is two hours ahead of Eastern Standard Time in the United States, and in Hawaii, which is five hours behind EST. (CNN) -- 12:56 p.m. -- More than 300 people have been confirmed dead in the quake, according to Chile's Office of Emergency Management. 12:40 p.m. -- Santiago airport still closed due to structural damage. Transiting passengers reportedly have had to spend the night outside, according to CNN Chile. 12:23 p.m. -- Four copper mines in Chile have suspended operations. The companies represent 16 percent of the country's total copper production. 9:49 p.m. EST -- Tens of thousands of residents were being evacuated from coastal Japan in anticipation of a possible tsunami, CNN's Kyung Lah reported. The northern part of the main island is looking at the possibility of a tsunami more than 9 feet high, she said. 9:28 p.m. EST -- Chilean Olympic skier Noelle Barahona says she will walk in closing ceremonies. Barahona told CNN's Larry King that her family was with her in Canada during the earthquake, but their home was damaged. 4:18 p.m. HST -- The Port of Honolulu was reopened to vessel traffic at about 2 p.m. Hundreds of vessels, including two cruise ships, remained off the south shore of Oahu during the port's closure. 10:50 p.m. -- The Philippines Institute of Volcanology and Seismology issued a Level-1 tsunami alert for the east coast of the Philippines. A Level-1 alert means no evacuation order is in effect, though individuals in the at-risk areas were advised to be ready to evacuate. 9:56 p.m. -- Tsunami warnings were canceled Saturday for all areas except Russia and Japan, the Pacific Tsunami Warning Center said. The cancellation does not mean it is safe to "resume normal activities or re-enter evacuated shoreline areas," the center said. County civil defense agencies and local police departments will make those determinations. 9:54 p.m. -- Emergency hospitals have been installed in the most critically damaged areas, said Minister of Health Alvaro Erazo, asking the population to go to the hospital only if necessary. 9:30 p.m. -- At least 45 aftershocks were reported, including a 6.1-magnitude in Argentina that killed a 58-year-old man and an 8-year-old boy in separate towns, the government-run Telam news agency said. 9:28 p.m. -- Teams from the aid organization Doctors Without Borders were expected to arrive in Chile Saturday night to evaluate the needs of quake victims. 9:10 p.m. -- Saturday's earthquake has affected two million people, Bachelet said, leaving 214 dead and 15 missing. 9:05 p.m. -- Chilean President Michelle Bachelet urges the people of her country to remain calm and conserve resources, including water and electricity, as the government works to restore order. 1:46 p.m. HST -- A tsunami warning has been lifted in Hawaii nearly two hours after the first waves came ashore, according to the Pacific Tsunami Warning Center. 1:40 p.m. HST -- Tsunami waves reached Australia along the Tasmanian coast, according to the Joint Australian Tsunami Warning Center. In Ventura County, California, navigational buoys sustained minor damage as a result of a 2-foot surge and waves, according to the Alaska Tsunami Warning Center. 1:30 p.m. HST -- An official with the Pacific Tsunami Warning Center says that Hawaii has "dodged a bullet" after smaller-than-expected waves came ashore from a tsunami generated by the Chilean quake. 1:20 p.m. HST -- Observed heights of the first tsunami waves in Hawaii ranged from .6 feet in Barbers Point and Kaumalapu to 3.2 feet in Kahului, according to the Pacific Tsunami Warning Center. 7:59 p.m. -- Chilean President Michelle Bachelet will address the nation at 8:55 local time (6:55 EST). 7:55 p.m. -- Google launches a page that has a Chile earthquake person finder tool and links to donate to relief efforts. 7:17 p.m. -- The death toll from Saturday's magnitude 8.8 earthquake has risen to 214, according to Chile's interior minister. 12:05 p.m. HST -- In Hilo Bay, sea level gauges of the first wave measure about one meter high, oceanographer Nathan Bedford tells CNN affiliate KHON. 11:56 a.m. HST -- The first waves of a tsunami have hit the Big Island of Hawaii, according to the Pacific Tsunami Warning Center. 11:30 a.m. HST -- In Honolulu, a sign at a local store limits families to two cases of spam as residents stock up on essentials in anticipation of high waters. Roads to beaches and other low-lying areas are closed and hotels are evacuating vacationers. 10:40 a.m. Hawaii Standard Time (HST) -- A tsunami warning has been issued for Hawaii. People are taking to high ground; California and Alaska remain under a tsunami advisory. 5:33 p.m. -- Warning sirens continue to sound in Hawaii, where authorities say the first wave could hit around 4 p.m. ET. 5:16 p.m. -- The Pan-American Highway is cut off in several places throughout Chile, according to Heraldo Munoz, Chile's Ambassador to the United Nations. So far, the country has not asked for international aid, he said. "Perhaps we will request some aid, but we have not done so so far." 4:59 p.m. -- Three alpine skiers representing Chile in the Olympics and their coaches plan to miss Sunday's closing ceremonies so they can attempt to return home, a team spokesman says. 4:53 p.m. -- The U.S. Coast Guard closes commercial ports in Hawaii to in-bound vessels to prepare for tsunami. Ships are safer at sea, where the waves are smaller. 4:26 p.m. -- Hawaii Gov. Linda Lingle said she has declared a state of emergency in advance. She urged people to listen to local officials. "I think the success that we're going to have in addressing this emergency is really on the shoulders of the people of Hawaii," she said. 4:22 p.m. -- The Salvation Army will send food, water, first aid kits and other basic supplies to Chile. A mobile canteen has already arrived, the organization said. 4:15 p.m. -- The U.S. State Department says Americans trying to locate U.S. citizens in Chile can call 1-888-407-4747 or e-mail ChileEarthquake@state.gov. State Department officials say they cannot help find people who are not U.S. citizens. 3:50 p.m. -- President Obama urged Americans to take tsunami warnings seriously. "The most important thing you can do is to closely heed the instructions of your local officials," he said on the White House lawn. 3:38 p.m. -- The death toll from Saturday's earthquake has risen to 147, a Chilean emergency official said. 3:33 p.m. -- Hilo International Airport, on the east side of the island of Hawaii ("the Big Island"), is closed in anticipation of a tsunami, a civil defense official said. 3:29 p.m. -- Chilean President Michelle Bachelet said she had received a report of a jail riot. "The jails have, of course, received significant damage," she said. "The Justice Department is looking into the situation (and) evaluating the damage. We are looking into possibly moving some of these inmates." 3:07 p.m. -- President Obama will make a statement at 2 p.m. ET (4 p.m. in Chile). 3:04 p.m. -- At least 33 aftershocks have been reported in the Chilean quake zone. 2:46 p.m. -- Hawaii's two U.S. senators, Daniel K. Inouye and Daniel K. Akaka, urged Hawaii residents to remain calm. "If you live in an evacuation zone I urge you to gather your family and please leave the area," Inouye said. 2:46 p.m. -- Pacific Tsunami Warning Center Director Charles McCreery said there was no possibility that Hawaii would not see an effect from the earthquake. "We believe it will be a threat here in Hawaii. That's why we initiated a warning, not only for a Hawaii, but for the entire Pacific," McCreery said. 2:36 p.m. -- The earliest estimated arrival time for a wave that could affect Hawaii is 11:05 a.m. HST(4:05 p.m. ET), according to the Pacific Tsunami Warning Center. The center had earlier reported the first wave could arrive at 11:19 a.m. HST. 2:15 p.m. -- The government of a Chilean province says a large wave killed three people and 10 were missing on the island of Juan Fernandez, 400 miles off the coast of Chile. 2:02 p.m. -- U.S. State Department now says two of its Embassy employees in Santiago are missing, after earlier reporting that all 118 were accounted for. 1 p.m. -- Evacuation sirens sounded in Hawaii at 6 a.m. (11 a.m. ET) alerting residents and visitors of a possible tsunami. The earliest estimated arrival for a wave that could affect Hawaii is 11:19 a.m. (4:19 p.m. ET), according to the Pacific Tsunami Warning Center. 12:40 p.m. -- Death toll in Chile rises to 122, according to President-elect Sebastian Pinera. 11:48 a.m. -- Chilean government says the death toll is 82. 11:37 a.m. -- United Nations Secretery-General Ban Ki-moon says, "The United Nations system, through its Office for the Coordination of Humanitarian Affairs, is on standby to offer rapid assistance to the Chilean government and people." 11:09 a.m. -- U.S. Embassy in Santiago says all 118 Embassy diplomats and employees are accounted for. 10:44 a.m. -- Santiago's airport was closed for at least the next 24 hours, head of airport operations Eduardo de Canto told Chile's TVN. The terminal suffered severe damage, but the runways were operational, he said. 9:48 a.m.
10:05 a.m. -- World Vision is sending supplies, including tarps, blankets and collapsable water containers into Chile with the help of Bolivia. 9:19 a.m. -- The United States is ready to help Chile and is closely monitoring the ongoing situation, White House press secretary Robert Gibbs said. 9:14 a.m. -- The American Red Cross has staff in shelters run by the local government in Hawaii and is also monitoring the potential for a tsunami, spokesman Jonathan Aiken said. 8:58 a.m. -- U.S. military officials say they are assessing the tsunami threat for Hawaii and whether military assets, such as ships or people, will need to evacuate the area. 8:10 a.m. -- Numerous aftershocks -- with the strongest at magnitude 6.9 -- were felt within hours of the initial quake, the USGS said. 8:10 a.m. -- Numerous tsunami waves have been reported in the Pacific, with one reaching as high as 7.7 feet in the central Chile coastal town of Talcahuano, the U.S. Geological Survey reported. 7:39 a.m. -- Buildings had partially collapsed in Concepcion, where rubble was strewn onto the streets, video from TVN showed. At least two fires also broke out, engulfing multistory buildings, TVN reported. The ceiling of a parking lot in the Las Condes neighborhood of Santiago came crashing down, pinning at least 50 cars underneath. 7:39 a.m. -- The capital lost electricity and basic services including water and telephones. People scavenged for supplies in supermarkets and pharmacies, TVN reports. 7:37 a.m. -- Chilean President Michelle Bachelet declares areas of catastrophe similar to a state of emergency, which allows her to cut through red tape to get aid. "I urge people in coastal zones to move to higher ground," she says. 3:44 a.m. -- Tsunami warning extended to the entire Pacific, including Hawaii. A tsunami warning is the highest level of a tsunami alert. The coastal areas from California to British Colombia and the coast of Alaska are under a tsunami advisory, the U.S. Geological Survey said. A tsunami advisory indicates dangerous currents for swimmers, boaters and coastal structures. 3:34 a.m. -- A magnitude 8.8 earthquake strikes Chile while most people are sleeping, at 3:34 a.m. (1:34 a.m. ET). The epicenter is off the coast of Chile's Maule region. The quake was felt in several Chilean towns and in parts of Argentina as well.